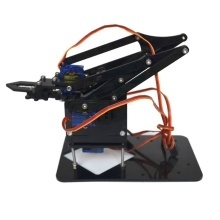 It is the most popular desktop mechanical arm nowadays. With the DIY kit, it not only takes you into the world of the maker, but also cultivates design skills. It is suitable for everyone from students to society. All movement joints are made of fine quality bearings with high precision. Full 4-axis moving to do extra extension and support for 180-degree robot servo. Need DIY assembly to improve hands-on ability and brain skills.